It’s official: 2014 was the hottest year on record topping both 2005 and 2010 according to NOAA and other sources. The brutal winter of 2014/5 also set records across much of the U.S for snowfall and temperatures. Add to this the drought punishing the Southwest and California, more frequent killer tornados and other weather occurrences, and more people are starting to believe something is occurring with our climate. Whether one chooses to believe all of these facts are planetary or man-made phenomenon, it’s hard to refute that our world is getting hotter and the climate is changing. 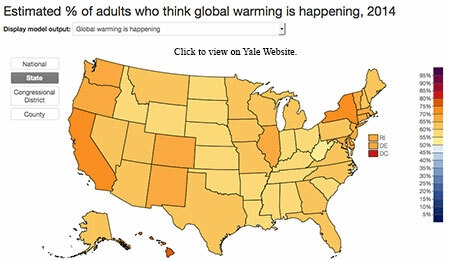 The Yale Project on Climate Change Communication recently updated its opinion survey data on the subject. The results are published on their website with a detailed map of the U.S. showing percentages by state of adults who think global warming is happening. The study in aggregate now shows 63% of U.S. adults believe climate change is happening and 48% feel it is mostly caused by human activity. That means nearly two thirds of adults in this country are concerned with the threat of climate change. Move down to a state level, and the change of opinion is even more pronounced. When the map was launched in early 2014 there were large pockets of the country with states where belief was below 50%. Today, not one state is below 50%. Now more than ever, Americans are worried about climate change, global warming and the effects that appear to be occurring already. 1. Cellulose insulation is made from recycled paper, which stems from a renewable natural resource in the form of wood cell matter derived from responsible forestry. Waste paper is diverted from landfills where it would otherwise decompose releasing carbon into the atmosphere. 2. Cellulose Insulation requires very low levels of energy to produce (low embodied energy.) This limits greenhouse gas emissions during the manufacturing process compared to other insulation products such as foam which can require up to 60 times more energy to produce. 3. Cellulose Insulation has excellent insulating properties to reduce energy consumption and emissions related to generating energy while making homes and buildings more comfortable. If you are concerned with climate change and looking to make a difference, choose highly recycled Eco-friendly products like cellulose insulation. A concious decision, made by millions of people, making hundreds of purchase decisions every year, can make a big impact on reducing climate change. This entry was posted in Cellulose Insulation, Energy Savings, Green Building, Green Products. Bookmark the permalink.